The ultra-smooth Nautilus NB3000 upright exercise bike is compact and quiet, and feels like a health club bike. If you care about your health, this is a good investment that you won’t mind making. The high-definition LED display has an alphanumeric readout and a 16 x 24 dot matrix course profile. A Results Mode comes up at the completion of your workout. It displays workout stats such as calories burned, average heart rate, average speed, time, distance, and more. 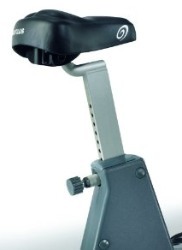 UPDATE: The NB3000 upright bike is no longer available. 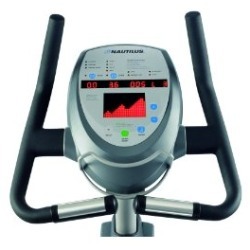 Check out the latest Nautilus exercise bikes on sale now at Amazon. The Nautilus NB3000 upright exercise bike comes well-packaged and takes about an hour to set up out of the box. User reviews have been overwhelmingly favorable on this unit, thanks to the advanced mechanical features such as the commercial grade and long-lasting Poly-V belt drive (the same type used on ellipticals) and a two-stage, frictionless electromagnetic resistance. 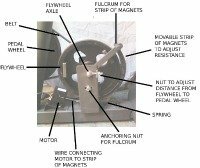 The Nautilus NB3000 is a self-generating bike so no power plug-in is required and it carries the following warranties – 30 years on the frame and 3 years on parts and electronics. Labor is covered for one year from date of original purchase. 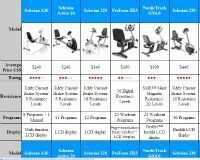 The six programs include 2 Heart Rate Control workouts, 2 Custom options, Manual, and Fitness Test. The exercise bike is equipped with both hand grip pulse rate sensors on the handlebars as well as a Polar wireless heart rate receiver. When you enter your age and weight before your session, the HRC programs will keep you exercising at your target heart rate by adjusting the resistance. You can use either the hand sensors or the chest strap (included). 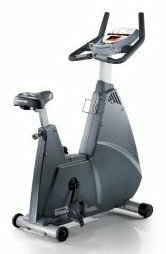 If you are looking at high-end bikes but don’t want to spend $2,000, consider that the Nautilus NB3000 upright exercise bike sells for around $700 - $800, which is a reasonable price for such a health-club type machine. It is super smooth and virtually silent with a rock solid frame that feels just like a commercial Nautilus stationary bike. This is a great indoor bike that you will look forward to riding daily.